Syfy’s space-based bounty hunter drama Killjoys has two shots left to make its mark, with Variety reporting today that the network has extended the series’ run for a pair of 10-episode final seasons. Once those are spent, though, time is up, a challenge the show’s creator/showrunner, Michelle Lovretta, sounds pretty excited to tackle. “This renewal is the kind of privilege every creator hopes for—a chance to plan the end of your story with the luxury of 20 episodes to do it,” Lovretta said in a statement. 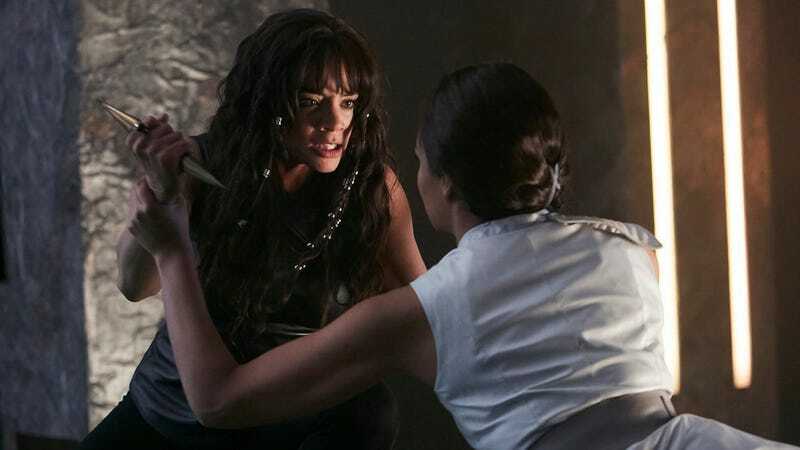 Killjoys wrapped up its third season tonight, as it continues to tell the stories of Dutch, Johnny, and D’avin (Hannah John-Kamen, Aaron Ashmore, and Luke Macfarlane), three badass bounty hunters who get wrapped up in ongoing conspiracies and Dutch’s mysterious past. The series typically airs on Friday nights, and will presumably be back on Syfy some time next summer for its fourth (and penultimate) season.